“I need a four-letter word ending in ‘T,’” I yelled out to my wife in the next room. My daughter in Indiana had gotten me hooked on an i-Phone app called “Words with Friends,” and here I am at 6:30 a.m. squinting at the screen. “Try SWOT,” my wife yells, and, feeling particularly stupid, the palm of my hand flies up to hit my head. How could I not have thought of this word that I have used almost every week for the past years and written countless time? In marketing business, SWOT has a special meaning because it’s an abbreviation for Strengths, Weaknesses, Opportunities and Threats. And for every small business, part of its annual planning process should be a SWOT analysis. 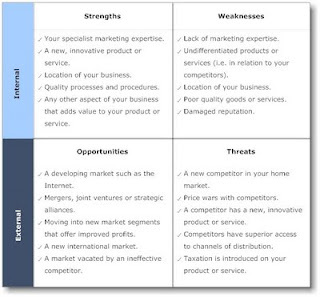 A SWOT analysis is a great way to identify and summarize many of the factors that can influence small business success. Along with goal setting and a marketing plan, it can help inform business owners and managers about their best choices for investment, hiring, promotion, and even new product development. I like to capture SWOT findings in a graphic consisting of a large rectangle divided into 4 equal squares. In the upper left goes a list of Strengths—the skills, abilities, and assets of the business. What does the business do particularly well? Are any employees “thought leaders” in their industry or can any employees be expected to make an extraordinary contribution to the business in the months ahead? Anything a customer wants that you provide and your competitor doesn't can constitute a possible strength. This is the place to list every aspect of the business that makes it a “stand out” enterprise. To the right of that rectangle goes Weaknesses, a list of problems, temporary or long term, which could impair success of the business in the months ahead. A cash-flow issue? Running out of space? No parking for customers? Lack the latest machine or offering? Rack your brains to think of anything that could hamper your business in the months ahead. This is the place to list them. In the bottom left square go those business bright spots that you see for the months ahead: Opportunities. If you provide house-cleaning services, find out how many potential customers are prospects moving into a new subdivision. If you’re a printer, find out what businesses are changing their names—and consequently in the market for re-branded stationery products. Are your present customers converting to a new platform and will they need migration services? What upcoming opportunities do you see for an uptick in business or profits? Finally, in the bottom right square--Threats. What stands between you and success? What specific development in the coming months could interfere with your plans for business success? Potential threats include downward price pressure, technology change, or even a specific competitor. It is possible for opportunities to become threats and vice versa. But advance thought and planning can reduce your exposure to threats and, sometimes, even transform them into strengths. For example, computer maker Dell has been locked in competition with HP for leadership in the PC market. Here is a SWOT analysis, compiled by a 3rd party as an exercise, of the factors effecting Dell in the next year. 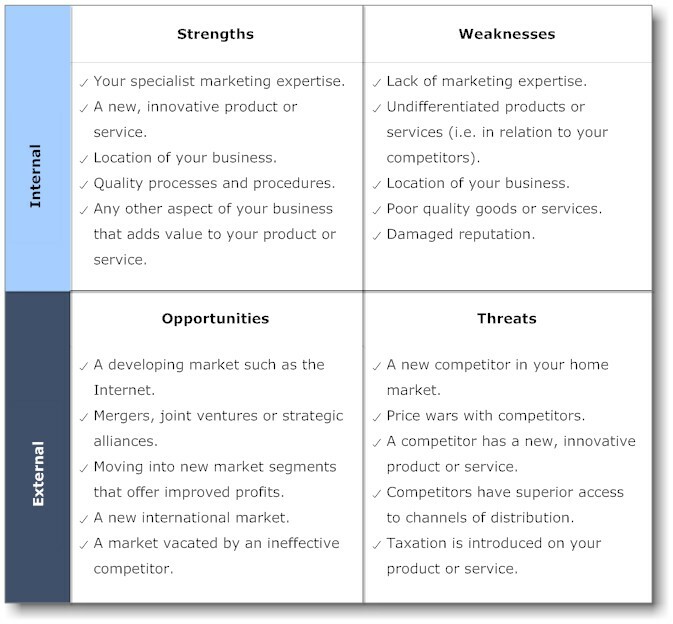 Once you’ve completed your SWOT analysis, you can use it to give your business an edge. Take all necessary steps to avoid the threats you’ve identified and leverage your strengths to position your business to take advantage of the opportunities you’ve identified.